Popular home video game consoles and computers, such as the Atari 2600, Atari 8-bit family, Apple II, Nintendo Entertainment System, Commodore 64, Atari Lynx, BBC Micro and others, used the 6502 or variations of the basic design. Soon after the 6502's introduction, MOS Technology was purchased outright by Commodore International, who continued to sell the microprocessor and licenses to other manufacturers. In the early days of the 6502, it was second-sourced by Rockwell and Synertek, and later licensed to other companies. In its CMOS form, which was developed by the Western Design Center, the 6502 family continues to be widely used in embedded systems, with estimated production volumes in the hundreds of millions. Motorola's target customers were established electronics companies such as Hewlett-Packard, Tektronix, TRW, and Chrysler. In May 1972, Motorola's engineers began visiting select customers and sharing the details of their proposed 8-bit microprocessor system with ROM, RAM, parallel and serial interfaces. In early 1974, they provided engineering samples of the chips so that customers could prototype their designs. Motorola's "total product family" strategy did not focus on the price of the microprocessor, but on reducing the customer's total design cost. They offered development software on a timeshare computer, the "EXORciser" debugging system, onsite training and field application engineer support. Both Intel and Motorola had initially announced a $360 price for a single microprocessor. (The IBM System/360 mainframe was a well known computer at the time.) The actual price for production quantities was much less. Motorola offered a design kit containing the 6800 with six support chips for $300. Peddle, who would accompany the sales people on customer visits, found that customers were put off by the high cost of the microprocessor chips. To lower the price, the IC chip size would have to shrink so that more chips could be produced on each silicon wafer. This could be done by removing inessential features in the 6800 and using a newer fabrication technology, "depletion-mode" MOS transistors. Peddle and other team members started outlining the design of an improved feature, reduced size microprocessor. At that time, Motorola's new semiconductor fabrication facility in Austin, Texas, was having difficulty producing MOS chips and mid 1974 was the beginning of a year-long recession in the semiconductor industry. Also, many of the Mesa, Arizona, employees were displeased with the upcoming relocation to Austin. Motorola Semiconductor Products Division's management was overwhelmed with problems and showed no interest in Peddle's low-cost microprocessor proposal. Chuck Peddle was frustrated with Motorola's management for missing this new opportunity. In a November 1975 interview, Motorola's Chairman, Robert Galvin, agreed. He said, "We did not choose the right leaders in the Semiconductor Products division." The division was reorganized and the management replaced. New group vice-president John Welty said, "The semiconductor sales organization lost its sensitivity to customer needs and couldn't make speedy decisions." Peddle began looking for a source of funding for this new project and found a small semiconductor company in Pennsylvania. In August 1974, Chuck Peddle, Bill Mensch, Rod Orgill, Harry Bawcom, Ray Hirt, Terry Holdt and Wil Mathys left Motorola to join MOS Technology. (Mike James joined later.) Of the seventeen chip designers and layout people on the 6800 team, seven left. There were 30 to 40 other marketers, application engineers and system engineers on the 6800 team. That December, Gary Daniels transferred into the 6800 microprocessor group. Tom Bennett did not want to leave the Phoenix area so Daniels took over the microprocessor development in Austin. His first project was a "depletion-mode" version of the 6800; this cut the chip area nearly in half and doubled the speed. The faster parts were available in July 1976. This was followed by the 6802 which added 128 bytes of RAM and an on-chip clock oscillator circuit. 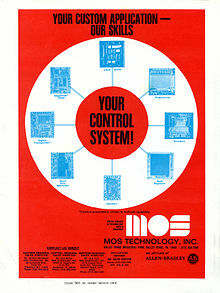 MOS Technology was formed in 1969 by three executives from General Instrument, Mort Jaffe, Don McLaughlin, and John Paivinen, to produce metal-oxide-semiconductor (MOS) integrated circuits. Allen-Bradley, a supplier of electronic components and industrial controls, acquired a majority interest in 1970. The company designed and fabricated custom ICs for customers and had developed a line of calculator chips. 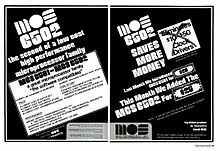 Introductory advertisement for the MOS Technology MCS6501 and MCS6502 microprocessors. The May 1976 datasheet omitted the 6501 microprocessor that was in the August 1975 version. Motorola was a billion-dollar company with a plausible case and lawyers. On October 30, 1974, Motorola had filed numerous patent applications on the microprocessor family and was granted twenty-five patents. The first was in June 1976 and the second was to Bill Mensch on July 6, 1976, for the 6820 PIA chip layout. These patents covered the 6800 bus and how the peripheral chips interfaced with the microprocessor. Motorola began making transistors in 1950 and had a portfolio of semiconductor patents. Allen-Bradley decided not to fight this case and sold their interest in MOS Technology back to the founders. Four of the former Motorola engineers were named in the suit: Chuck Peddle, Will Mathys, Bill Mensch and Rod Orgill. All were named inventors in the 6800 patent applications. During the discovery process, Motorola found that one engineer, Mike James, had ignored Peddle's instructions and brought his 6800 design documents to MOS Technology. In March 1976, the now independent MOS Technology was running out of money and had to settle the case. They agreed to drop the 6501 processor, pay Motorola $200,000 and return the documents that Motorola contended were confidential. Both companies agreed to cross-license microprocessor patents. That May, Motorola dropped the price of a single 6800 microprocessor to $35. By November, Commodore had acquired MOS Technology. Another important use of the 6500 family was in video games. The first to make use of the processor design was the Atari VCS, later renamed the Atari 2600. The VCS used an offshoot of the 6502 called the 6507, which had fewer pins and, as a result, could address only 8 KB of memory. Millions of the Atari consoles would be sold, each with a MOS processor. Another significant use was by the Nintendo Entertainment System and Famicom. The 6502 used in the NES was a second source version by Ricoh, a partial system-on-a-chip, that lacked the binary-coded decimal mode but added 22 memory-mapped registers and on-die hardware for sound generation, joypad reading, and sprite list DMA. Called 2A03 in NTSC consoles and 2A07 in PAL consoles (the difference being the memory divider ratio and a lookup table for audio sample rates), this processor was produced exclusively for Nintendo. The Atari Lynx used a 4MHz version of the chip, the 65SC02. The internal logic runs at the same speed as the external clock rate, but despite the slow clock speeds (typically in the neighborhood of 1 to 2 MHz), the 6502's performance was competitive with other contemporary CPUs using significantly faster clocks. This is partly due to a simple state machine implemented by combinational (clockless) logic to a greater extent than in many other designs; the two phase clock (supplying two synchronizations per cycle) can thereby control the whole machine-cycle directly. Typical instructions might take half as many cycles to complete on the 6502 than contemporary designs. Like most simple CPUs of the era, the dynamic NMOS 6502 chip is not sequenced by a microcode ROM but uses a PLA (which occupied about 15 percent of the chip area) for instruction decoding and sequencing. As in most eight-bit microprocessors, the chip does some limited overlapping of fetching and execution. The MOS Technology 6503 had reduced memory addressing capability (4 KB) and no RDY input, in a 28-pin DIP package (with the phase 1 (OUT), SYNC, redundant Vss, and SO pins of the 6502 also omitted). The MOS Technology 6504 had reduced memory addressing capability (8 KB), no NMI, and no RDY input, in a 28-pin DIP package (with the phase 1 (OUT), SYNC, redundant Vss, and SO pins of the 6502 also omitted). 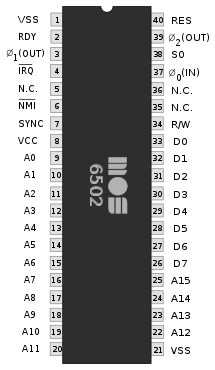 The MOS Technology 6505 had reduced memory addressing capability (4 KB) and no NMI, in a 28-pin DIP package (with the phase 1 (OUT), SYNC, redundant Vss, and SO pins of the 6502 also omitted). The MOS Technology 6506 had reduced memory addressing capability (4 KB), no NMI, and no RDY input, but all 3 clock pins of the 6502 (i.e. a 2-phase output clock), in a 28-pin DIP package (with the SYNC, redundant Vss, and SO pins of the 6502 also omitted). The MOS Technology 6507 had reduced memory addressing capability (8 KB) and no interrupts, in a 28-pin DIP package (with the phase 1 (OUT), SYNC, redundant Vss, and SO pins of the 6502 also omitted). The NMOS 6502 family has a variety of undocumented instructions, which vary from one chip manufacturer to the next. The 6502's instruction decoding is implemented in a hardwired logic array (similar to a programmable logic array) that is only defined for 151 of the 256 available opcodes. The remaining 105 trigger strange and occasionally hard-to-predict actions, such as crashing the processor, performing two valid instructions consecutively, performing strange mixtures of two instructions, or simply doing nothing at all. Eastern House Software developed the "Trap65", a device that plugged between the processor and its socket to convert (trap) unimplemented opcodes into BRK (software interrupt) instructions. Some programmers utilized this feature to extend the 6502's instruction set by providing functionality for the unimplemented opcodes with specially written software intercepted at the BRK instruction's 0xFFFE vector. All of the undefined opcodes have been replaced with NOP instructions in the 65C02, an enhanced CMOS version of the 6502, although with varying byte sizes and execution times. In the 65C802/65C816, all 256 opcodes perform defined operations. The 6502's memory indirect jump instruction, JMP (<address>), is partly broken. If <address> is hex xxFF (i.e., any word ending in FF), the processor will not jump to the address stored in xxFF and xxFF+1 as expected, but rather the one defined by xxFF and xx00 (for example, JMP ($10FF) would jump to the address stored in 10FF and 1000, instead of the one stored in 10FF and 1100). This defect continued through the entire NMOS line, but was corrected in the CMOS derivatives. The 6502's read-modify-write instructions perform one read and two write cycles. First the unmodified data that was read is written back, and then the modified data is written. This characteristic may cause issues by twice accessing hardware that acts on a write. This anomaly continued through the entire NMOS line, but was fixed in the CMOS derivatives, in which the processor will do two reads and one write cycle. Defensive programming practice will generally avoid this problem by not executing read/modify/write instructions on hardware registers. ^ "The MOS 6502 and the Best Layout Guy in the World". swtch.com. 2011-01-03. Retrieved 2014-08-09. ^ "MOnSter6502". monster6502.com. 2017. Retrieved 2017-05-01. ^ William Mensch, Rob Walker (October 9, 1995). Interview with William Mensch (Web video). Atherton, California: Silicon Genesis, Stanford University Libraries. William Mensch and the moderator both pronounce the 6502 microprocessor as "sixty-five-oh-two". ^ "Western Design Center (WDC) Home of 65xx Microprocessor Technology". www.westerndesigncenter.com. Retrieved 2019-04-08. ^ "Motorola Sues MOS Technology" (PDF). Microcomputer Digest. Cupertino CA: Microcomputer Associates. 2 (6): 11. December 1975. ^ "Motorola joins microprocessor race with 8-bit entry". Electronics. New York: McGraw-Hill. 47 (5): 29–30. March 7, 1974. ^ Buchanan, John K., "MOS DC Voltage booster circuit", US Patent 3942047, issued March 2, 1976. ^ Buchanan, John K., "Chip topography for MOS integrated circuitry microprocessor chip", US Patent 3987418, issued October 19, 1976. ^ Mensch Oral History (1995) Mensch earned an Associate degree from Temple University in 1966 and then worked at Philco Ford as an electronics technician before attending the University of Arizona. ^ Mensch, William D., "Chip topography for MOS interface circuit", US Patent 3968478, issued July 6, 1976. ^ Jenkins, Francis; Lane, E.; Lattin, W.; Richardson, W. (November 1973). "MOS-device modeling for computer implementation". Circuit Theory, IEEE Transactions on. IEEE. 20 (6): 649–658. doi:10.1109/tct.1973.1083758. ISSN 0018-9324. All of the authors were with Motorola's Semiconductor Products Division. ^ Donohue, James F. (October 27, 1988). "The microprocessor first two decades: The way it was". EDN. Cahners Publishing. 33 (22A): 18–32. ISSN 0012-7515. Page 30. Bennett already was at work on what became the 6800. "He hired me," Peddle says of Bennett, "to do the architectural support work for the product he'd already started." … Peddle says. "Motorola tried to kill it several times. Without Bennett, the 6800 would not have happened, and a lot of the industry would not have happened, either." ^ Hepworth, Edward C., Rodney J. Means, Charles I. Peddle, "Asynchronous Communication Interface Adaptor", Patent 3975712, issued August 17, 1976. Note: Motorola typically listed inventors in alphabetical order. ^ Motorola (August 5, 1976). "They stay out front with Motorola's M6800 Family". Electronics. McGraw-Hill. 49 (16): 51. Advertisement showing three embedded applications from TRW, HP and RUSCO. ^ "It's the total product family". Electronics. New York: McGraw Hill. 48 (1): 37. January 9, 1975. Motorola advertisement emphasizing their complete set of peripheral chips and development tools. This shorten the customers product design cycle. ^ "Motorola microprocessor set is 1 MHz n-MOS". Control Engineering. 21 (11): 11. November 1974. MC6800 microprocessor price was $360. The MC6850 asynchronous communications interface adaptor (ACIA) was slated for first quarter 1975 introduction. ^ Intel Corporation (1984). Kaye, Glynnis Thompson, ed. A Revolution in Progress - A History to Date of Intel (PDF). Intel Corporation. p. 14. Order number:231295. Archived (PDF) from the original on 23 October 2012. Retrieved 30 December 2016. "Shima implemented the 8080 in about a year and the new device was introduced in April 1974 for $360." ^ "Motorola mounts M6800 drive". Electronics. New York: McGraw-Hill. 48 (8): 25. April 17, 1975. "Distributors are being stocked with the M6800 family, and the division is also offering an introductory kit that includes the family's six initial parts, plus applications and programming manuals, for $300." ^ Bagnall (2010), p. 11. Peddle's new offer came at an opportune time for the 6800 developers. "They didn't want to go to Austin, Texas," explains Mensch. ^ Waller, Larry (November 13, 1975). "Motorola seeks to end skid". Electronics. New York: McGraw-Hill. 48 (23): 96–98. Summary: Semiconductor Products split into two parts, integrated circuits and discrete components. Semiconductor losses for the last four quarters exceeded $30 million. The sales organization lost its sensitivity to customer needs, "delays in responding to price cuts meant that customers bought elsewhere." Technical problems plagued IC production. The troubles are "not in design, but in chip and die yields." Problems have been solved. The MC6800 microprocessor "arrived in November 1974." ^ "Electronics Newsletter: 6800 gains speed, lower prices by summer". Electronics. New York: McGraw-Hill. 49 (5): 25. March 4, 1976. ^ Daniels, R. Gary (December 1996). "A Participant's Perspective". IEEE Micro. IEEE Computer Society. 16 (5): 21–31. doi:10.1109/40.546562. Daniels, "My first assignment was to lead a small team to redesign the 6800 MPU to make it more manufacturable and so that higher speed versions could be selected." ^ Bagnall (2010), p. 13. 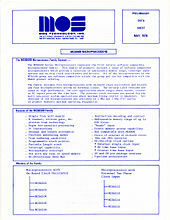 ^ MOS Technology (November 14, 1974). "The First Single Chip Scientific Calculator Arrays". Electronics. McGraw-Hill. 47 (23): 90–91. ^ Bagnall (2010), p. 19 "Paivinen promised Peddle he would have the n-channel process ready. He was true to his word." ^ a b c Cushman, Robert H. (September 20, 1975). "2-1/2 Generation μP's -$10 Parts That Perform Like Low-End Mini's" (PDF). EDN. Boston: Cahners Publishing. 20 (17): 36–42. " ^ "Microprocessor line offers 4, 8,16 bits". Electronics. New York: McGraw-Hill. 48 (15): 118. July 24, 1975. The article covers the 6501 and 6502 plus the 28 pin versions that would only address 4K of memory. It also covered future devices such as "a design that Peddle calls a pseudo 16". ^ Sugarman, Robert (25 August 1975). "Does the Country Need A Good $20 Microprocessor?" (PDF). EE Times. Manhasset, New York: CMP Publications: 25. ^ Fylstra, Daniel (November 1975). "Son of Motorola (or the $20 CPU Chip)". Byte. Peterborough, NH: Green Publishing. 1 (3): 56–62. Comparison of the 6502 and the 6800 microprocessors. Author visited MOS Technology in August 1975. ^ "3rd Generation Microprocessor" (PDF). Microcomputer Digest. Cupertino, CA: Microcomputer Associates. 2 (2): 1–3. August 1975. ^ "MOS 6501 Microprocessor beats 'em all". Electronics. New York: McGraw-Hill. 48 (16): 60–61. August 7, 1975. ^ "MOS 6502 the second of a low cost high performance microprocessor family". Computer. IEEE Computer Society. 8 (9): 38–39. September 1975. doi:10.1109/C-M.1975.219074. ^ Signetics (October 30, 1975). "Easiest-to-use microprocessor". Electronics. McGraw-Hill. 48 (22): 114–115 – via Wikimedia Commons. ^ Motorola (October 30, 1975). "All this and unbundled $69 microprocessor". Electronics. McGraw-Hill. 48 (22): 11. The quantity one price for the MC6800 was reduced from $175 to $69. The previous price for 50 to 99 units was $125. ^ Motorola was awarded the following US Patents on the 6800 microprocessor family: 3962682, 3968478, 3975712, 3979730, 3979732, 3987418, 4003028, 4004281, 4004283, 4006457, 4010448, 4016546, 4020472, 4030079, 4032896, 4037204, 4040035, 4069510, 4071887, 4086627, 4087855, 4090236, 4145751, 4218740, 4263650. ^ "Motorola, MOS Technology settle patent suit". Electronics. New York: McGraw-Hill. 49 (7): 39. April 1, 1975. "MOS Technology Inc. of Norristown, Pa. has agreed to withdraw its MCS6501 microprocessor from the market and to pay Motorola Inc. $200000 ..." "MOS Technology and eight former Motorola employees have given back, under court order documents that Motorola contends are confidential." "…both companies have agreed to a cross license relating to patents in the microprocessor field." ^ "Mergers and Acquisitions". Mini-Micro Systems. Cahners. 9 (11): 19. November 1976. " Commodore International … is buying MOS Technology (Norristown, PA). This saves the six-year-old semiconductor house from impending disaster." ^ a b Goodwins, Rupert (December 4, 2010). "Intel's victims: Eight would-be giant killers". ZDNet. Retrieved March 7, 2012. ^ Reimer, Jeremy. "Personal Computer Market Share: 1975-2004". Archived from the original on 6 June 2012. Retrieved 2009-07-17. ^ "How many Commodore 64 computers were sold?". Archived from the original on 2016-03-06. Retrieved 2011-02-01. ^ "Code Execution on a Tamagotchi". kwartzlab.ca. 7 May 2013. Archived from the original on 2018-08-31. Retrieved 2018-12-23. ^ Corder, Mike (Spring 1999). "Big Things in Small Packages". Pioneers' Progress with picoJava Technology. Sun Microelectronics. Archived from the original on 2006-03-12. Retrieved April 23, 2012. The first 6502 was fabricated with 8 micron technology, ran at one megahertz and had a maximum memory of 64k. ^ Randy M. Dumse. "The R65F11 and F68K Single-Chip Forth Computers". [permanent dead link] 1984. ^ Ed Schmauch. "A Computerized Corrosion Monitoring System"[permanent dead link]. 1986. ^ Lawrence P. Forsley. "Embedded systems: 1990 Rochester Forth Conference : June 12 - 16th, 1990 University of Rochester". p. 51. ^ Rockwell. "RSC-Forth User's Manual". 1983. ^ "rockwell :: dataBooks :: 1985 Rockwell Data Book" – via Internet Archive. ^ "Advanced 6502". 2013-11-16. Retrieved 2016-04-02. With the 65GZ032 Gideo Zweijtzer has built a VHDL core that is 6502 compatible, but extends the 8 bit core with a 32 bit design. ^ "Measuring the ROR Bug in the Early MOS 6502". Retrieved 8 May 2011. ^ Moser, Carl W. (January 1979). "Add a Trap Vector for Unimplemented 6502 Opcodes" (PDF). Dr. Dobb's Journal of Computer Calisthenics and Orthodontia. No. 31. Menlo Park, California. p. 32. Retrieved 2017-01-07. ^ Harrod, Dennette A. (October 1980). "The 6502 Gets Microprogrammable Instructions". BYTE. Vol. 5 no. 10. Peterborough, New Hampshire. p. 282. Retrieved 2017-01-07. ^ Draco (19 June 1997). "65c02, 6502, 65816 ??? CPU sells but who`s buying..." Archived from the original on 2 January 2008. ^ Andrews, Mark (1984). "6". Atari Roots - A Guide To Atari Assembly Language. ISBN 0-88190-171-7. Matthews, Ian (June 4, 2007). "The Rise of MOS Technology & The 6502". Running Technologies Inc. Archived from the original on 2018-10-04. Retrieved 2018-12-23.